January 18, 2019 (1422 words) :: Scooter startups should not exist. If we want scooters, they should be a public service. This post is day 18 of a personal challenge to write every day in 2019. See the other fragments, or sign up for my weekly newsletter. This post is about scooters, and the tech companies who use them in order to satisfy their megalomaniacal pursuit of growth. 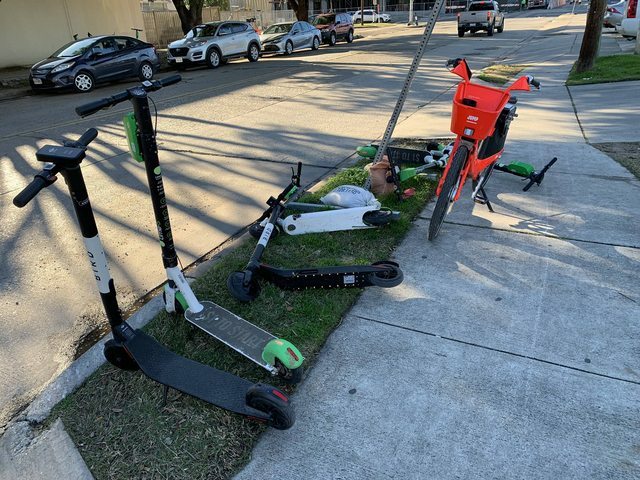 Intermingled Bird and Lime scooters in various states of uprightness, next to an Jump/Uber bike. Another shot of the scooter crowd above but from farther away, revealing a Spin, a Jump, and another Bird scooter. 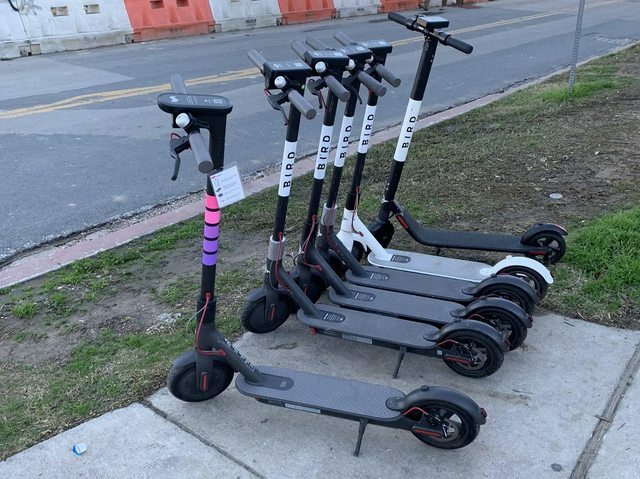 A lone Lyft scooter sidling up next to 5 Birds. Note how, apart from the branding, they’re basically identical. 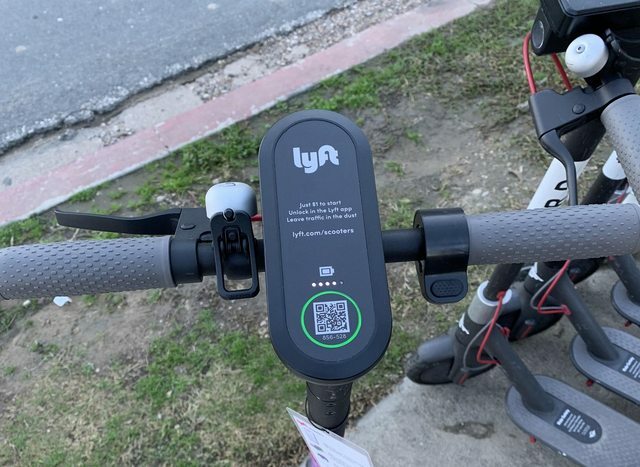 A closer look at the instructions for using the Lyft scooter. A bunch of Jump scooters all neatly lined up. Why did I take all these photos? Because I was astounded at how many scooters there were. 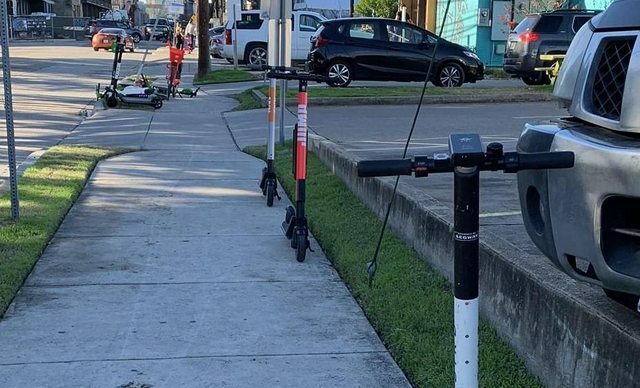 (The photos above only showcase a tiny sliver of the scooter population of Austin, Texas.) Nothing had prepared me for this. 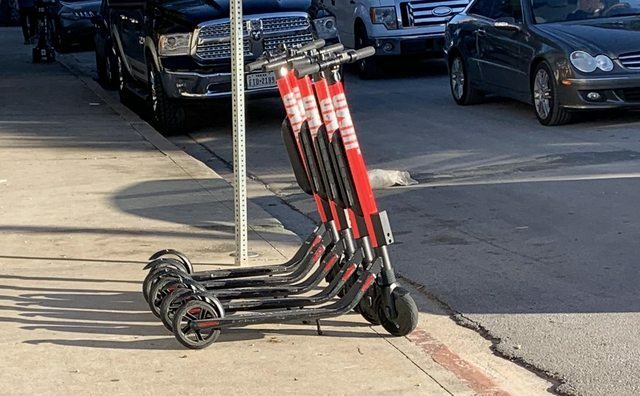 I had read a few articles about the trend of tech companies littering urban areas with scooters, and I had written about the absurd valuations of micro-mobility startups for the New Socialist newsletter just a few days prior, but I didn’t know it was that bad. It was kind of shocking. I had never seen any in London, and the only US city I’d spent much time in lately is San Francisco, where I did notice a lot of scooters (different brands, though: some of the early startups were banned by SFMTA). But in Austin, they were everywhere: buzzing by on the streets, or hanging out on the sidewalk, ranging from neatly lined up side by side to haphazardly strewn in the middle of the path. It felt like entering an alien landscape. It was just a profoundly different experience of a city. And I didn’t like it. That’s not to say that the scooters themselves are necessarily bad. I tried out a Lyft scooter, and made a few desultory laps around a parking lot (it didn’t go very fast). Slower than a bike, but more low-key and certainly faster than walking. You kind of look like a dork on them, but whatever, they’re fine. What rankles is the way (slightly) enhanced mobility has become commodified. That 5-ish minute joyride cost $1.37, which may be cheap in absolute terms, but you know, when there are so many scooters just lying around, completely idle, it doesn’t feel like a reasonable price. If you drank some water from a water fountain and someone random tech startup tried to charge you $1.37 for it (because the button that controls the fountain is an Internet of Things device), you would be pretty pissed off, too. Doubly so if you accidentally touched the water fountain without paying for it and it began bleating (true story, but for a scooter). I know I bang on about socialism all the time, but these scooters are such a great example of something that could be provided under municipal socialism. Imagine if they were provided for free as a municipal-level public service. They could be situated exactly where they would be most useful, rather than scattered about wherever some competing tech companies think they should be. They could be available completely free of charge - after all, the scooters themselves are cheap enough that the companies don’t really seem to care if they get stolen or not - and you wouldn’t need a smartphone and a credit card to access them. They could vanish into the background of the urban landscape until we take their presence (and lack of cost) for granted, the way we don’t expect to pay a toll to use a water fountain or elevator or crosswalk. Of course, that doesn’t mean that merely making scooters free is itself going to bring about socialism. Free scooters would be the consequence, not the cause, of socialist strategy enacted on a policy level; it has a whole bunch of other dependencies, some of which are really quite fundamental. Privatised scooters are merely a symptom of a much larger problem, arising from the capitalist drive to enclose as much of common life as possible, as I wrote in the latest NS newsletter. You can’t simply introduce free scooters into the economic landscape as it is now, and expect them not to be vandalised, or stolen, or cut back during the next round of budget cuts; rather, you have to transform the economic landscape such that free scooters are possible. And that requires a massive paradigm shift. As a political rallying point, “free scooters” is fairly frivolous. But it’s a simple one, and it makes for an illuminating thought experiment if we start with the demand for free scooters, and work backwards from there. What else would you have to change so that scooters can be free? How could scooters be made available as a public service? The main objection to free scooters is probably the possibility of theft. Even now, despite the putative “protections” afforded by the alarm sounds if someone tries to steal one (similar to a car alarm), people still manage to steal them and strip them for parts. To deter that, you could criminalise their theft, and increase the presence of law enforcement and/or electronic surveillance to the point where people are frightened into abiding by the law. But that in itself sounds pretty dystopian, and it isn’t really getting at the root cause of most theft, which is simply, poverty. If you want to disincentivise theft, then you need to reduce inequality. Not only will that remove the material reasons that drive people to theft, it will also go some way toward transforming peoples’ subjectivity such that public goods are respected. You’d have a much more communal notion of property and social welfare. So what I’m really saying is that if you want free scooters, you need to vanquish inequality. Kind of that famous Carl Sagan quote: to make an apple pie from scratch, you must first create the universe. The goal of this “scooters as a public service” thought experiment is to demonstrate that none of this can be done with the state as it is now. That’s the point which most criticism of the efficacy of public services fails to grasp. Tech libertarians, in particular, seem to love this line of reasoning; they point to existing government institutions that seem bureaucratic, inefficient, or corrupt and say, aren’t private companies a better alternative? Aren’t they leaner and savvier and ultimately more effective? How could these dumb socialists want more government? But socialists don’t want more of the government as it is now. Socialists recognise that the state is a terrain of struggle, and that right now, its interests are more aligned with capital than actually serving the people it is ostensibly set up to serve. Scooters should be a free public service, along with healthcare, public transit, and really everything else (in due course). The fact that they’re not says less about the failure of public services as a whole, and more about the fact that our whole economic landscape has been designed such that multiple competing scooter companies can fight each other for dominance, with no discernible public benefit. We take for granted that this fairly basic technology is commercialised and deployed according to the whims of private enterprise, rather than treated as a public good to be used for the benefit of all. It doesn’t have to be this way. But that doesn’t mean it’s going to be an easy task, as if you could just press some big button labelled “nationalise” and everything would magically get better. To get to the point where nationalisation (or expropriation, or whatever you want to call it) is even a viable option requires a huge political fight, which you could reasonably sum up with one world: socialism. And there’s way more than free scooters at the end of that.